New Mills is situated on the confluence of the Rivers Sett and Goyt and built on the Torrs sandstone gorge which lies at the heart of the town. 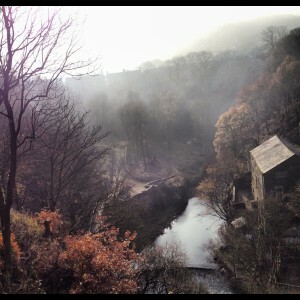 New Mills dates back to the 14th century, when the corn mills known as the ‘New Milne’ were built. With local coal readily available, and plentiful power from both rivers to power the mills, with the coming of the industrial revolution New Mills blossomed to become the busy town that it is today with its 10,000 residents, enjoying many amenities. Traditional indoor and outdoor markets, many independent shops, cafes, historic architecture and outstanding scenery make it a thriving hub for local residents, tourists and outlying villagers alike. Semi-rural, blending in the heritage of mining and mills, with outstanding views of the Kinder Plateau, the town is an excellent gateway to the Peak District National Park, nearby Lyme Park, the canal network and the rest of neighbouring Cheshire, whilst having excellent bus and train links to Buxton, Glossop, Stockport, Manchester, Sheffield and beyond.